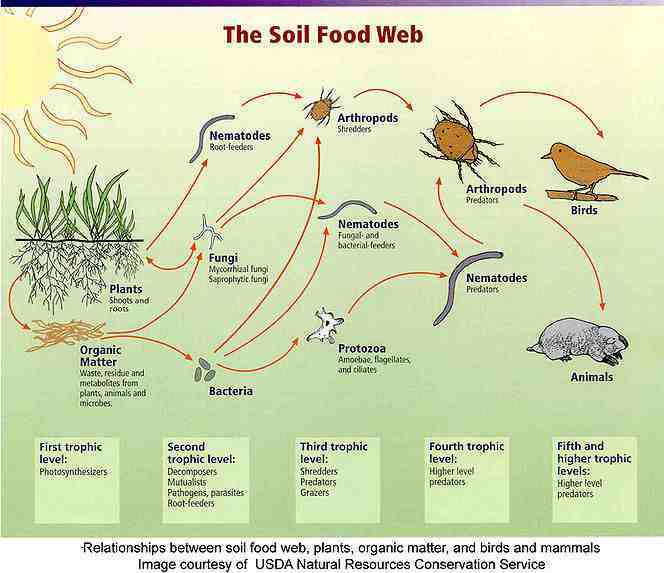 soil food web. And that should be the whole point of working the soil; to feed it, so it can feed your plants, which in turn will give you the best tasting, nutrient-rich produce. I wanted to see for myself if the 80/20 ratio of soil to compost (that several university studies have determined give the best plant growth) could be born out in a test of my own. In June, I was given 5 Jalapeno pepper plants and decided to use them for my test. 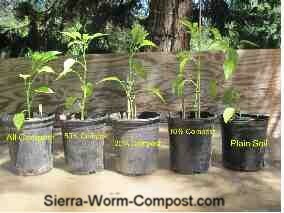 One gallon nursery containers were used to re-pot the peppers. 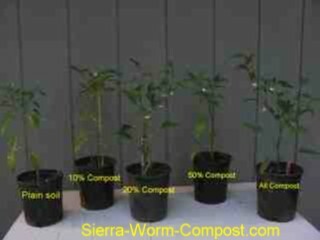 For ease of measuring I mixed 10 cups of garden soil for each pot to which I added 1, 2 and 5 cups of worm compost respectively to give a ratio of 10, 20 and 50 percent. I then used enough of each mix to fill the containers. They were placed in full sun and equally watered 2-3 times a week depending on my moisture probe reading. and were very root-bound. 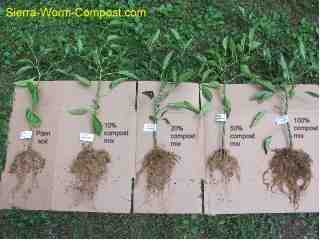 As with all root balls, they were carefully loosened and trimmed to encourage vertical growth. The lack of growth was obvious in the plain-soil pepper and it had yet to produce any blossoms. Some of its leaves remained yellow. 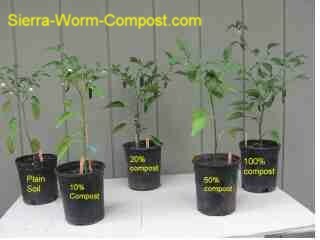 The pepper in 10% worm compost had 11 blossoms and only a few more leaves than the plain-soil plant, but they were a vibrant green. The 20% compost mix plant had 13 blossoms and was a close 2nd in size to the all-compost plant. 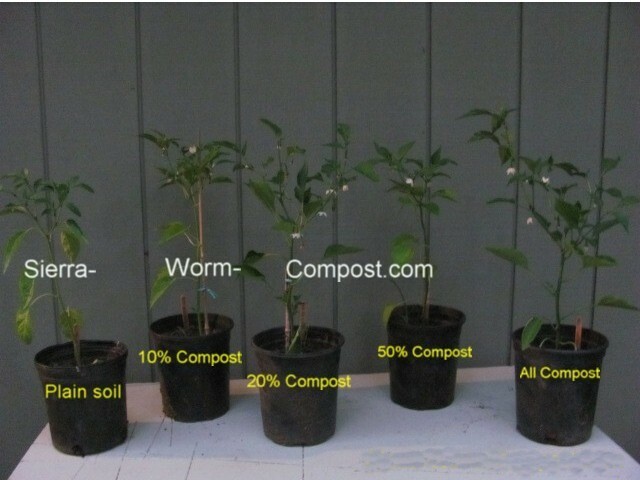 The all-compost pepper had only 8 blossoms, but the most growth, in terms of height. (Some fruiting blossoms on each plant may not be visible, as they had not yet opened fully, but were counted in that plant's production). 11 days later and peppers were in various stages of formation. The plant in plain soil had finally developed 9 blossoms, some of which had developed into fruit buds. The pepper in plain soil having 3 peppers with 2 additional fruit buds. Leaf count was 34. The 10% mix plant had 4 fruit with 2 additional fruit buds. Leaf count was 55. A total of 5 peppers were still maturing from July 23 in the 20% compost plant. There were 4 more developing fruit. Leaf count was 49 leaves. 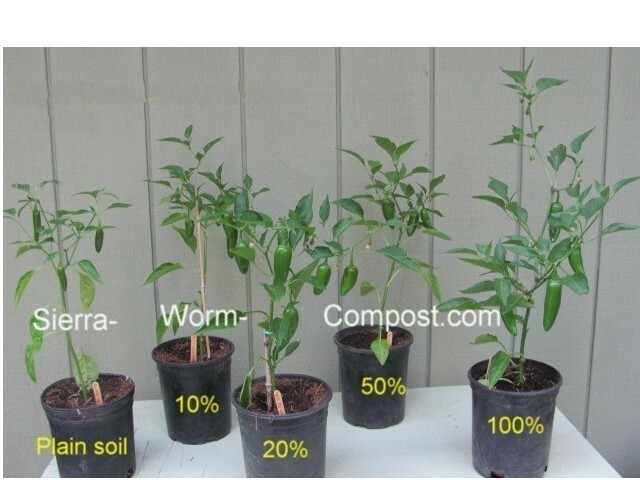 The 50% compost mix pepper had developed 1 more fruit for a total of 4 peppers with only one more developing fruit. The plant in all-compost still had 5 peppers growing, but they were much larger than all the rest with the biggest one measuring 3 in. This plant had 6 more buds mainly from the additional growth since 7-25. It was October 1 and the weather was turning cooler. 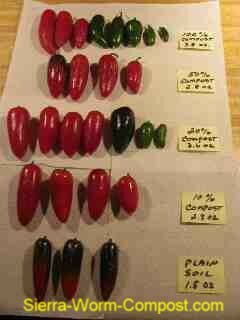 I decided it was time to harvest the peppers and find out the plant growth total of each plant's fruit weight. Keep in mind that one pepper had fallen off the 100% compost plant when it was moved. Its weight of .7 oz was included in the plant's total. The final phase of this plant growth test was when I removed the plants from their pots to see the root structure of each plant. Assuming that the pepper in plain soil would have the smallest mass of roots, I was surprised when I found that the pepper in the 50% mix was even smaller. As was pointed out to me, there may have been something else going on with the 50% plant that I was unaware. Had I done several simultaneous side-by-side tests, I probably would have gotten a different result. But that will be for another day. The all-compost plant had the largest mass, as I had expected; so much so that I could not rinse off all the compost for fear of pulling off some roots! To a lesser extent, I had the same problem with the 20% pepper. The one thing I should have done would have been to cut off the roots just above the stem and weighed them as the picture doesn't tell the whole story. Even without the root weight, I'm glad I undertook the experiment. The results validated to me the claims that I have read. 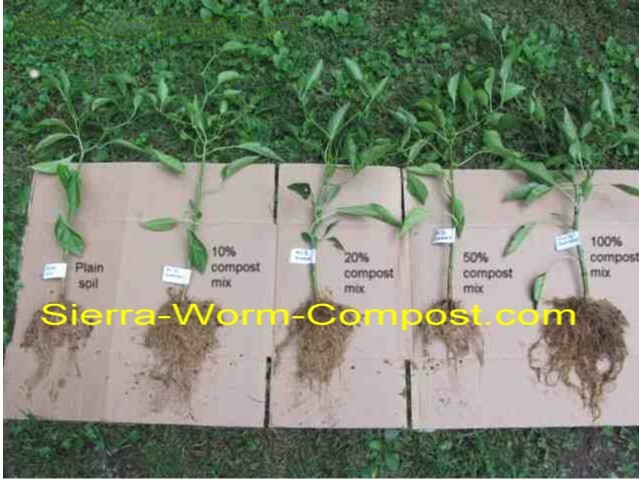 It's one thing to say worm compost and worm tea are the natural way to increase plant growth; it's quite another to be able to show the results. And as the old saying goes, "seeing is believing"! Your mileage may vary, but in this case, over the all-compost plant, the 20% plant produced only 2 peppers less, but the cost per pepper was almost 4 times cheaper! 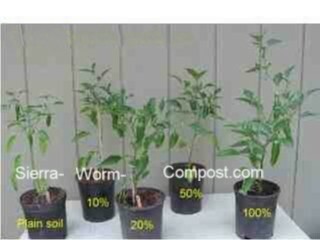 Have you set up a plant experiment or noticed some outstanding growth due to using worm compost or worm tea? Share it! Do you have pictures to add? Great! (Maximum file size is 800x600). Click the button, select the pic and click to choose it.